The UK Natural Environment Research Council (NERC) is running a programme entitled Environmental Evidence for the Future that is intended to identify research required to help the UK meet environmental challenges over the next few decades. Prof Andrew Pullin has been asked to Chair the programmes Advisory Group that will help NERC identify the challenges and the evidence gaps that will inform the prioritisation of NERC's research funding. The Second International Conference of the Collaboration for Environmental Evidence will be held during April 16-20th 2018 at Ecole des Ponts ParisTech, Champs sur Marne, Paris, France. For further details go to www.environmentalevidence.org/meetings or follow CEE on Twitter @EnvEvidence, or join CEE LinkedIn group (Collaboration for Environmental Evidence). CEBC Research Fellow, Salamatu Fada, presents work on 'conservation success' at ICCB. Salamatu Fada, a Research fellow based at CEBC, recently presented a talk on 'Local communites' perception of protected area management' at the International Congress of Conservation Biology in Columbia. The talk formed part of a session on 'Critically examining notions of success in conservation'. Salamatu's project (GyaraYankari) is funded by Bauchi State and aims to inform a new Management Plan for Yankari Game Reserve in northern Nigeria. You can access the talk here. Following the 2016 Colloquium Chaired by His Majesty King Carl XVI Gustaf of Sweden, and featured in a previous news item, a book entitled 'Environmental Reality: Rethinking the Options' has been published gathering together the main contributions. His Majesty closes his introduction by stating 'Stewardship of the environment is not just a matter of ethics it has become essential to human survival on our planet. This is the message we hope to send current and coming generations who will lead environmental development and protection for the future'. 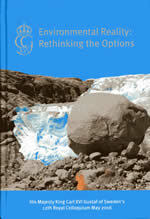 CEBC Director, Andrew Pullin, contributed a Chapter on 'Using evidence to inform environmental management decisions'. 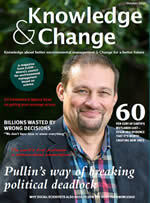 CEBC Director Andrew Pullin is featured in an edition of knowledge and change where he is asked about the reasons why he became interested in the development of evidence-based environmental management. CEBC Director, Andrew Pullin, has been invited by King Carl XVI Gustav of Sweden to attend his Royal Colloquium “Environmental reality: Rethinking the options”. The 2016 Royal Colloquium to be held on May 23-25th is planned to be the final activity in the Colloquium series and will provide an opportunity to draw on the experiences and results from earlier events as well as providing a message for future research and action. Previous colloquia covered a broad number of subjects including water, energy, agriculture, and climate, with geographical foci ranging from coastal areas to mountains and from tropical regions to the Arctic. With this wide range of examples in mind, it is possible to explore the trends and critical factors which are forming history as well as providing challenges and opportunities for the future. How to get from knowledge to action has been a recurring theme in all earlier colloquia. Complexity, resilience and vulnerability are systems concepts which have been put forward in the analysis. However, it was also emphasized that action and implementation are critically dependent on institutions and ultimately on values and trust in society. Thus, the program of the Royal Colloquium 2016 will revisit some of the recurring themes of previous colloquia with cross-cutting general aspects in mind, focusing not only on problem descriptions but also on opportunities and possible solutions. Defra has recently published a report prepared by CEBC on 'Emerging Tools and Techniques to Deliver Timely and Cost Effective Evidence Reviews'. The report uses CEE Systematic Review methodology as a gold standard for evidence review and gives advice on a range of methods to fit circumstances of time, resources and susceptibility to bias. CEBC Director, Andrew Pullin comments that this demonstrates the impact of emerging methodology of systematic review in environmental policy and the impact of the work of CEE and its Centres. CEBC Director , Andrew Pullin, presented a plenary talk to Environmental Officers from USAID in Washington DC last Month. USAID is the lead U.S. Government agency that works to end extreme global poverty and enable resilient, democratic societies to realize their potential. The talk was entitled ‘Synthesising environmental evidence to inform practice and policy’ and demonstrated how CEE Evidence Reviews can address the evidence needs of an organisation such as USAID working on the relationships between environment and human wellbeing. Prof Andrew Pullin, Director of CEBC recently spent a week in Chile delivering a traing course on the use of CEE Systematic Reviews in environmental management. The course was funded by the British Council under the Newton-Picarte exchange scheme with Chile and was hosted by the Millennium Nucleus Center for Socioeconomic Impact of Environmental Policies (CESIEP), Pontificia Universidad Católica de Chile, Santiago. The trainees were from the Chilean Ministry for the Environment and a smaller delegation subsequently visited the UK and met with representatives from Defra and the Environment Agency. Andrew Pullin commented that 'we hope this is the beginning of a longer term collaboration that will build capacity in Chile and more broadly in Latin America to conduct and utilise CEE systematic reviews. During october, Prof Andrew Pullin, from the Centre for Evidence-Based Conservation, attended a Roundtable Meeting in the Houses of Parliament to discuss the definition of evidence in Parliament. The meeting was organised by the Parliamentary Office for Science and Technology and involved 20 people, roughly half from the two houses and half from academia and NGO’s. The purpose of the meeting was to review the way Parliament uses the term evidence in its work and to move toward a more transparent and critical use of evidence sources. Prof Pullin commented that ‘it was a fascinating insight into the history of the use of evidence in Parliament could mark the first steps in a major change in working practices’. A summary of the meeting and its future work will be published in due course. Prof. Andrew Pullin, Director of the Centre for Evidence-Based Conservation (CEBC) based in SENRGY, was invited to present the Centre's work on systematic review and evidence synthesis to Defra's Strategic Network Evidence Group at their meeting 'Evidence Reviews and Communicating Evidence Quality' in London on Nov 5th. The meeting was attended by Defra’s Chief Scientific Advisor, Prof Ian Boyd, and Defra Permanent Secretary, Bronwyn Hill. The CEE Guidance, originally developed at CEBC, is now recognised by Defra (and similar organisations globally) as a ‘gold standard’ methodology for evidence synthesis to inform decision making and policy formation in the environmental sector. New CEE Systematic Map published: Evidence on the environmental impacts of farm land abandonment in high altitude/mountain regions. Link. New CEE systematic review published on human wellbeing impacts of terrestrial protected areas. New CEE systematic review just published online on the conservation impacts of between-population outbreeding. The translocation of plants or animals between populations has been used in conservation to reinforce populations of threatened species, and may be used in the future to buffer species' ranges from the anticipated effects of climate change. This population admixture can result in outbreeding, and has the potential to undermine conservation plans that mix populations of declining or threatened species. CEE now has an open Discussion Group on the LinkedIn platform. If you are registered on LinkedIn simply search for Collaboration for Environmental Evidence under 'Groups' and join in! CEBC has been used as the model for the establishment of a new centre for Evidence-Based Environmental Management (EviEM) in Sweden. CEBC Director, Prof. Andrew Pullin comments on this exciting development in the EviEM Annual Report. Click Here. CEBC welcomes the creation of new CEE centres. Two new CEE Centres have been established alongside CEBC to reflect the global scope of CEE systematic reviews. Further details. CEE now has an open Discussion Group on the LinkedIn platform. If you are registered on LinkedIn simply search for Collaboration for Environmental Evidence under 'Groups' and join in! The study published in Frontiers in Ecology and the Environment suggests that although there is limited evidence that CFM provides some biodiversity benefits in terms of forest protection, evidence for benefit to local communities is generally lacking. The team from the Centre for Evidence-Based Conservation based at Bangor University conducted a systematic review of evidence by examining studies from a highly dispersed literature on the subject. They found that very few studies had been published providing information on CFM performance. Many of those that did had problems with their study design and interpretation. CFM puts management decisions in the hands of local communities, rather than national or regional government, allowing them to make key decisions about the use of their forests. The assumption is that conferring ownership and responsibility will result in more sustainable use of resources. New! Two PhD studentships involving the Centre for Evidence-Based Conservation are advertised: "Testing the effectiveness of forest governance mechanisms in conservation policy and practices" and "Assessment of vegetation and key plant species responses to the restoration of degraded rich-fen systems in north-west Wales". Please follow the links to find out more. The UK Department for Environment Food & Rural Affairs (Defra) and the Natural Environment Research Council (NERC) call for applications to conduct pilot reviews under the Living with Environmental Change (LWEC) research programme. Applications can be made for awards of up to £15,000 for pilot reviews, outlining the existing data and highlighting trends and gaps in current knowledge, on areas relating to LWEC Objective B "to manage ecosystems for human well-being and protect the natural environment as the environment changes". Further funding may be available to develop promising pilot reviews into full systematic reviews. The closing date for applications is 20th February 2009. For more information or to apply, please follow the link to NERC's LWEC events page. Draft protocols and reviews are no longer made available on the CEBC website and instead are now handled by the Collaboration for Environmental Evidence. All draft documents currently available for public consultation can be accessed via their 'Drafts' section and the CEE will also now be responsible for managing the peer review process. The draft protocol for the review "Effectiveness of mitigation actions for great crested newts" is now available for comment. Please visit the CEBC protocols page to access the protocol. There is also a form available on this page for providing comments. The deadline for feedback on this protocol has now passed. The draft protocol for the review "Do managed grazed lands contribute to conservation of plant diversity in Australian temperate grassy eucalypt woodland?" is now available for comment. Please visit the CEBC protocols page to access the protocol. There is also a form available on this page for providing comments. The deadline for feedback on this protocol has now passed. The draft protocol for the review "Does translocation of individuals between populations result in net cost or benefit to fitness in offspring of mixed populations?" is now available for comment. Please visit the CEBC protocols page to access the protocol. There is also a form available on this page for providing comments. The deadline for feedback on this protocol has now passed. 15th September 2008 - Draft protocol for comment - Parrot conservation. The draft protocol for the review "Effectiveness of protected areas for the conservation of threatened species of the Genus Amazona" is now available for comment. Please visit the CEBC protocols page to access the protocol. There is also a form available on this page for providing comments. The deadline for feedback on this protocol has now passed. 8th September 2008 - Draft protocol for comment - Forest fire impact mitigation. The draft protocol for the review "Does seeding after severe forest fires mitigate negative impacts on soils and plant communities?" is now available for comment. Please visit the CEBC protocols page to access the protocol. There is also a form available on this page for providing comments. The deadline for feedback on this protocol has now passed. 8th September 2008 - Draft protocol for comment - Rangeland fire impact mitigation. The draft protocol for the review "Does seeding after rangeland fires mitigate negative impacts on soils and plant communities?" is now available for comment. Please visit the CEBC protocols page to access the protocol. There is also a form available on this page for providing comments. The deadline for feedback on this protocol has now passed. 1st September 2008 - Draft review for comment - African wild dog re-introduction. The draft systematic review "Effectiveness of African wild dog (Lycaon pictus) re-introductions in South Africa" is now available for comment. Please visit the CEBC reviews page to access the review. There is also a form available on this page for providing comments. The deadline for feedback on this protocol has now passed. 26th August 2008 - Draft protocol for comment - Restoration of crocodile populations. The draft protocol for the review "Effectiveness of the release of individuals reared in captivity as a tool to restore crocodile populations (order Crocodylia, Genus Crocodylus) in the Neotropics" is now available for comment. Please visit the CEBC protocols page to access the protocol. There is also a form available on this page for providing comments. The deadline for feedback on this protocol has now passed. 26th August 2008 - Draft protocol for comment - Environmental education for Andean Bear conservation. The draft protocol for the review "Effectiveness of environmental education initiatives for the conservation of the Andean bear in the Andes mountain range" is now available for comment. Please visit the CEBC protocols page to access the protocol. There is also a form available on this page for providing comments. The deadline for feedback on this protocol has now passed. 12th August 2008 - Draft protocol for comment - Jaguar conservation. The draft protocol for the review "Are protected areas an effective strategy for the conservation of jaguar (Panthera onca) populations?" is now available for comment. Please visit the CEBC protocols page to access the protocol. There is also a form available on this page for providing comments. The deadline for feedback on this protocol has now passed. 12th August 2008 - Draft protocol for comment - Resolving human-jaguar conflict. The draft protocol for the review "Is translocation of problematic jaguars (Panthera onca) an effective strategy to resolve human-predator conflicts?" is now available for comment. Please visit the CEBC protocols page to access the protocol. There is also a form available on this page for providing comments. The deadline for feedback on this protocol has now passed. 8th August 2008 - Draft protocol for comment - Orinoco crocodile conservation. The draft protocol for the review "Effectiveness of protected areas for the conservation of Orinoco crocodile (Crocodylus intermedius) and American crocodile (C. acutus) in Latin-American countries" is now available for comment. Please visit the CEBC protocols page to access the protocol. There is also a form available on this page for providing comments. The deadline for feedback on this protocol has now passed. 8th August 2008 - Draft protocol for comment - Caribbean marine turtle nests. The draft protocol for the review "Does the relocation of caribbean marine turtle nests to hatcheries improve their hatching success?" is now available for comment. Please visit the CEBC protocols page to access the protocol. There is also a form available on this page for providing comments. The deadline for feedback on this protocol has now passed. 5th August 2008 - Draft protocol for comment - Nature and stress. The draft protocol for the review "Does contact with nature have an effect on physiological or psychological stress?" is now available for comment. Please visit the CEBC protocols page to access the protocol. There is also a form available on this page for providing comments. The deadline for feedback on this protocol has now passed. 5th August 2008 - Draft protocol for comment - Venezuelan River Turtle conservation. The draft protocol for the review "Effectiveness of protected areas for the conservation of freshwater turtle species native to Venezuela" is now available for comment. Please visit the CEBC protocols page to access the protocol. There is also a form available on this page for providing comments. The deadline for feedback on this protocol has now passed. 30th July 2008 - Draft protocol for comment - Effectiveness of Venezuelan River Turtle recovery strategies. The draft protocol for the review "Effectiveness of nest management and population reinforcement in the recovery of river turtle populations in Venezuela." is now available for comment. Please visit the CEBC protocols page to access the protocol. There is also a form available on this page for providing comments. The deadline for feedback on this protocol has now passed. 28th July 2008 - Draft protocol for comment - Carbon stores and mangement of peat soils. The draft protocol for the review "How do flooding and draining affect carbon stores in peat soils?" is now available for comment. Please visit the CEBC protocols page to access the protocol. There is also a form available on this page for providing comments. The deadline for feedback on this protocol has now passed. 23rd July 2008 - Draft protocol for comment - The Evidence Base for Community Forest Management. The draft protocol for the review "The Evidence Base for Community Forest Management as a Mechanism for Supplying Environmental Benefits and Improving Rural Welfare" is now available for comment. Please visit the CEBC protocols page to access the protocol. There is also a form available on this page for providing comments. The deadline for feedback on this protocol has now passed. 22nd July 2008 - Draft protocol for comment - management of Mountain Pine Beetle. The draft protocol for the review "What management practices are effective in preventing an infestation of Mountain Pine Beetle in Colorado's front range forests?" is now available for comment. Please visit the CEBC protocols page to access the protocol. There is also a form available on this page for providing comments. The deadline for feedback on this protocol has now passed. 22nd July 2008 - Draft protocol for comment - Andean Bear conservation. The draft protocol for the review "Effectiveness of protected areas for the conservation of the andean bear, Tremarctus ornatus" is now available for comment. Please visit the CEBC protocols page to access the protocol. There is also a form available on this page for providing comments. The deadline for feedback on this protocol has now passed. 22nd July 2008 - Draft review for comment - European Red Fox control interventions. The draft systematic review "Do control interventions effectively reduce the impact of European red foxes on conservation values and agricultural production in Australia?" is now available for comment. Please visit the CEBC reviews page to access the review. There is also a form available on this page for providing comments. The deadline for feedback on this review has now passed. 11th April 2008 - Draft protocol for comment - wooded riparian zones and stream biota. The draft protocol for the review "What are the effects of wooded riparian zones on stream temperature and stream biota?" is now available for comment. Please visit the CEBC protocols page to access the protocol. There is also a form available on this page for providing comments. The deadline for feedback on this protocol has now passed. 8th April 2008 - Draft protocol for comment - structural connectivity in Australia's fragmented terrestrial landscapes. The draft protocol for the review "Does structural connectivity facilitate effective dispersal of native species in Australia’s fragmented terrestrial landscapes?" is now available for comment. Please visit the CEBC protocols page to access the protocol. There is also a form available on this page for providing comments. The deadline for feedback on this protocol has now passed. The draft protocol for the review "What is the evidence for the development of connectivity to improve species movement, as an adaptation to climate change?" is now available for comment. Please visit the CEBC protocols page to access the protocol. There is also a form available on this page for providing comments. The deadline for feedback on this protocol has now passed. 6th March 2008 - Draft protocol for comment - thinning/burning of ponderosa pine and natural fire behaviour. The draft protocol for the review "Do thinning and/or burning treatments on ponderosa pine and related forests in western USA produce restoration of natural fire behaviour?" is now available for comment. Please visit the CEBC protocols page to access the protocol. There is also a form available on this page for providing comments. The deadline for feedback on this protocol has now passed. 6th March 2008 - Draft review for comment - impact of human recreation on breeding raptors. The draft review "What are the impacts of human recreational activity on the distribution, nest-occupancy rates, and reproductive success of breeding raptors?" is now available for comment. Please visit the draft reviews page to access the draft review. There is also a form available on this page for providing comments. The deadline for feedback on this review has now passed. 18th February 2008 - Draft protocol for comment - climate change, urban greening and human health. The draft protocol for the review "How effective is ‘greening’ of urban areas in reducing human exposure to ground level ozone concentrations, UV exposure and the ‘urban heat island effect’?" is now available for comment. Please visit the CEBC protocols page to access the protocol. There is also a form available on this page for providing comments. The deadline for feedback on this protocol has now passed. 14th February 2008 - Draft protocol for comment - environment and human health. The draft protocol for the review "How effective is direct accessing of semi-natural environments in the promotion of health and well-being compared with other forms of ‘exposure’ to the natural environment or with accessing ‘synthetic environments’?" is now available for comment. Please visit the CEBC protocols page to access the protocol. There is also a form available on this page for providing comments. The deadline for feedback on this protocol has now passed. 12th February 2008 - Draft protocol for comment - monitoring methods for terrestrial vegetation. The draft protocol for the review "Comparison of methodologies for the monitoring and surveillance of terrestrial vegetation " is now available for comment. Please visit the CEBC protocols page to access the protocol. There is also a form available on this page for providing comments. The deadline for feedback on this protocol has now passed. 22nd January 2008 - The CEBC advertises a new post. The CEBC is currently looking to recruit a new Research Officer to work on a NERC funded project: "Using systematic review methodology to establish an evidence base for implementing climate change strategy". Please visit our 'Jobs' page for more details. Please note: the deadline for applications has now passed. 15th January 2008 - Draft protocol for comment - predator control and bird populations. The draft protocol for the review "Is predator control an effective strategy for enhancing bird populations? " is now available for comment. Please visit the CEBC protocols page to access the protocol. There is also a form available on this page for providing comments. The deadline for feedback on this protocol has now passed. 7th December 2007 - Draft protocol for comment - tropical dry forest restoration. The draft protocol for the review "What is the impact of disturbance on tropical dry forest restoration" is now available for comment. Please visit the CEBC protocols page to access the protocol. There is also a form available on this page for providing comments. The deadline for feedback on this protocol has now passed. 6th December 2007 - Draft review available for comment - impact of grazing on heathland. The draft review "How does the impact of grazing on heathland compare with other management methods?" is now available for comment. Please visit the CEBC draft reviews page to access the review. There is also a form available on this page for providing comments. The deadline for feedback on this review has now passed. 6th December 2007 - Draft protocol for comment - salt marsh restoration. The draft protocol for the review "Does salt marsh restoration benefit bird populations or their habitats?" is now available for comment. Please visit the CEBC protocols page to access the protocol. There is also a form available on this page for providing comments. The deadline for feedback on this protocol has now passed. 20th November - Draft review for comment - marine protected areas. The draft review "Are marine protected areas effective tools for sustainable fisheries management " is now available for comment. Please visit the CEBC draft reviews page to access the review. There is also a form available on this page for providing comments. The deadline for feedback on this review is Thursday 20th December. The deadline for feedback on this review has now passed. 15th November - Draft protocol for comment - farm biodiversity conservation. The draft protocol for the review "The effectiveness of integrated farm management, organic farming and agri-environment schemes as interventions for biodiversity conservation" is now available for comment. Please visit the CEBC protocols page to access the protocol. There is also a form available on this page for providing comments. The deadline for feedback on this protocol is Monday 17th December. The deadline for feedback on this protocol has now passed. 8th October - Draft protocol for comment - Impacts of marine aquaculture. The draft protocol for the review "What are the ecological impacts of marine aquaculture on biotic and abiotic components of the water column?" is now available for comment. Please visit the CEBC protocols page to access the protocol. There is also a form available on this page for providing comments. The deadline for feedback on this protocol has now passed. 29th August - Final review on effects of salmonid stocking now available - please visit the CEE Library. The draft protocol for the review "Does instream wood placement affect salmonid growth, survival or habitat complexity?" is now available for comment. Please visit the CEBC protocols page to access the protocol. There is also a form available on this page for providing comments. The deadline for feedback on this protocol has now passed. The draft version of systematic review 13 "What are the effects of salmonid stocking in lakes on native fish populations and other fauna and flora?" is now available. Please visit the CEBC draft review page to access the review. The deadline for feedback on this protocol has now passed. The draft protocol for the review "Factors Influencing the Success Rate of Reintroduction of Endangered Animal Species." is now available for comment. Please visit the CEBC protocols page to access the protocol. There is also a form available on this page for providing comments. The deadline for feedback is May 2, 2007. The deadline for feedback on this protocol has now passed. The draft protocol for the review "What is the Effectiveness of Vertebrate Reintroductions for Conservation Purposes in the Iberian Peninsula?" is now available for comment. Please visit the CEBC protocols page to access the protocol. There is also a form available on this page for providing comments. The deadline for feedback is May 2, 2007. The deadline for feedback on this protocol has now passed. The draft protocol for the review "What are the Effects of Recreational Activities on Breeding Success or Breeding-Site Fidelity of Diurnal Raptors?" is now available for comment. Please visit the CEBC protocols page to access the protocol. There is also a form available on this page for providing comments. The deadline for feedback is May 2, 2007. The deadline for feedback on this protocol has now passed. The draft protocol for the review "What is the Effectiveness of Culling to Reduce Population Growth Rates of Gull Colonies?" is now available for comment. Please visit the CEBC protocols page to access the protocol. There is also a form available on this page for providing comments. The deadline for feedback is May 2, 2007. The deadline for feedback on this protocol has now passed. The draft protocol for the review "Are methods for the eradication of Rattus species on islands effective?" is now available for comment. Please visit the CEBC protocols page to access the protocol. There is also a form available on this page for providing comments. The deadline for feedback is April 7, 2007. The deadline for feedback on this protocol has now passed. The CEBC publications page has been updated to include new peer-reviewed publications. These include papers on assessment of windfarm impacts on birds, effectiveness of asulam for bracken control, effectiveness of hedgerow corridors between fragments of woodland habitat, effectiveness of ragwort control, and Bayesian Belief Networks as a tool for evidence-based conservation management. The final version of systematic review 11 "The effectiveness of land-based schemes (incl. agri-environment) at conserving farmland bird densities within the U.K." is now available. Please visit the CEE Library to access either the summary or full version of the review. The final version of of systematic review 21 "Are Japanese knotweed (Fallopia japonica) control and eradication interventions effective?" is now available. Please visit the CEE Library to access either the summary or full version of the review. The draft protocol for the review "Are marine protected areas effective tools for sustainable fisheries management?" is now available for comment. Please visit the CEBC protocols page to access the protocol. There is also a form available on this page for providing comments. The deadline for feedback is January 3, 2006. The deadline for feedback on this protocol has now passed. The final version of of systematic review 22 "The effectiveness of management options used for the control of Spartina species" is now available. Please visit the CEE Library to access either the summary or full version of the review. The draft protocol for the review "Do control interventions effectively reduce the impact of European red foxes on biodiversity and agricultural production in Australia?" is now available for comment. Please visit the CEBC protocols page to access the protocol. There is also a form available on this page for providing comments. The deadline for feedback is December 15, 2006. The deadline for feedback on this protocol has now passed. The draft version of systematic review 21 "Are Japanese knotweed (Fallopia japonica) control and eradication interventions effective?" is now available. Please visit the CEBC draft review page to access the review. The deadline for feedback on this review is December 1, 2006. The deadline for feedback on this review has now passed. The CEBC publications page has been updated to include a new peer-reviewed publication of our guidelines for undertaking a systematic review in conservation and environmental management. The CEBC presentations page has been updated to include a number of recent conference poster presentations. Conferences attended were the first European Congress for Conservation Biology (Eger, Hungary), the British Ecological Society Annual Meeting (Oxford, UK) and the International Conference on Riverine Hydrology: Advances in Research and Applications (Stirling, UK). Talks were also presented at the BES and ECCB conferences by members of the CEBC. The final version of of systematic review 12 "Does the use of in-stream structures and woody debris increase the abundance of trout and salmon?" is now available. Please visit the CEE Library to access either the summary or full version of the review. A talk about this review was presented at the 15th International Salmonid Conference at Newcastle-Gateshead - a picture from the conference can be seen here. The draft version of systematic review 22 "The effectiveness of management options used for the control of Spartina species" is now available. Please visit the CEBC draft review page to access the review. The deadline for feedback on this review is October 31, 2006. The deadline for feedback on this review has now passed. News and events items from before August 2006.